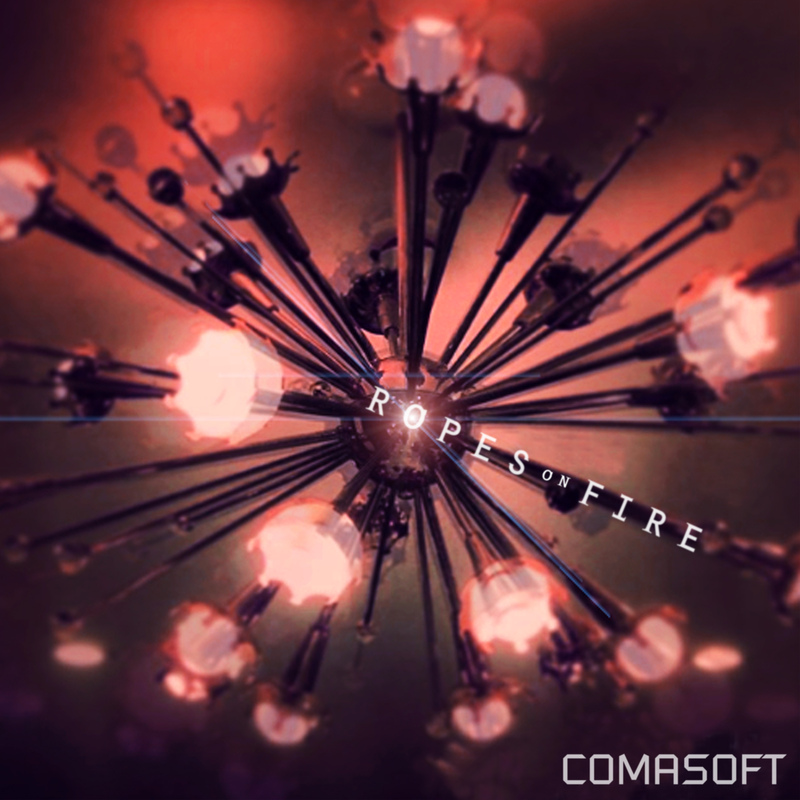 Review – Comasoft – Ropes on Fire – Life as a photographer and loving this new life! Comasoft is a pop rock band from Chicago, IL that have some keyboards, guitars and a weakness for the 1980’s – mostly because fuzzy keyboards and Brian Adams riffs should never go out of style and we don’t want to live in a world where they are. Comasoft is currently booking shows, playing everywhere their 20 year old van will take them and trying to rule the world. So come and join us in bringing back rock-n-roll, general debauchery, and fun! Comasoft sound like Kill Hannah, Placebo, New Order, Madina Lake, The Cure and AFI. This EP was recorded and mixed by Chuck Mack (of Ghosthouse fame) at Ekectrowerks, and all photos courtesy of Kenra Sandsmark. “West Town” has a really good melody, catchy hooks throughout the song (with guitars and keyboards) and is performed well by all members. “Ropes on fire/I climb higher” gives me a clue that when the heat is on, this band gets it on and goes the distance and beyond. “All my friends try to tell me no/They see me break and they tell me so/And when I reach out to hold your…../All of my try to tell me no” can be seen many different ways by many different people. Keeping the lyrics general is a good thing in this song as this could be seen by friends that you’re trying to help out by giving them advice which can lead to other things (mostly bad in this case) in the long run of any relationship. You need to think for yourself. “Waiting In Vain” starts out with a cool little guitar riff and explodes with the other instruments joining in. “When you start to shake/When your hands grow cold/And your eyes stare off into space/I got you/ Why don’t you/Understand me when you’re falling/Well I’m still waiting/Waiting in vain” are some pretty great lyrics about how someone can feel about another person. It could be early in a relationship where you are waiting for something to happen or looking for a sign. Or a friendship that is changing into a relationship and you’re still not too sure about whether to take it to the next level. The music is really well suited to the lyrics which makes in a stand out song on the EP. “I Won’t Tell If You Don’t” is choppy song musically which features a good bass riff with starts and stops in all the right places. “I won’t tell if you don’t/Just how far we could go” is a bit of a mystery and again is general in its meaning. It could be many things which my gutter mind thinks of and I probably wouldn’t be far off the mark. It’s a well done song. “Bang” is a really good song lyrically and musically. “Your bullets/With my name on one” and “Bang/Now I’m dead on the floor/Bang/Now you got my attention/Shot through me” makes it really clear what’s going on in the song. And the melody is a fast paced one with good backing vocals in all the right places. Great song! “All I Wanted” has some really good vocal work by Jay. I really like his voice fronting the music. The emotion coming out of him is evident in this song. As it’s an acoustic version, you can really feel the words sung by Jay as the music is stripped down. “All I wanted to say/I didn’t want it to end this way” pretty much sums up a lot of emotions in one song about a relationship that ended in failure, abruptly and possibly soaked in emotion. Well done! “Lights Out” seemed so familiar to me when I first heard this song. Such bare bones with only an acoustic guitar and a few keys added in to make a point. This song makes me think of close friends who have passed on in some tragic way that is shocking. It’s a very well done song that is sad and plaintive in hearing Jay’s vocals. “Waiting In Vain” the acoustic version is very well done. Same lyrics but stripped down, it has a sad quality to it which comes across in the vocals by Jay. All is all this is a stellar EP and just proves that this is a band that is working it’s way up in the Chicago scene and could quite possibly take on national recognition in the near future if they keep doing what they do best – making good music that people can relate to in whatever way possible and by being themselves. The other music they have out on iTunes or from their website are: Burn to Shine EP, The Beautiful Departure EP, Impulsive EP and Comasoft (self) LP. You can find all this awesome music on iTunes US and Canada or you buy it on the bands’ website. Blue Amp Management, Francesca Campobasso by email: francesca@blueampmusic.com (also, pleaes cc email to comasoftinfo@gmail.com).